A *too cute for words* pink and black Scottie dog tea pot that my mom got for me at Homegoods! Kate Puck Green Starfish Earrings that I won from the lovely Southern Living: Preppy Style. The adorable gifts I received from my Lilly Secret Sister Swap partner... yummy Lilly Animal Crackers and a gorgeous necklace and earring from her jewelry line, Caroline Grace. Light blue gingham shirt that I picked up on sale at J Crew. 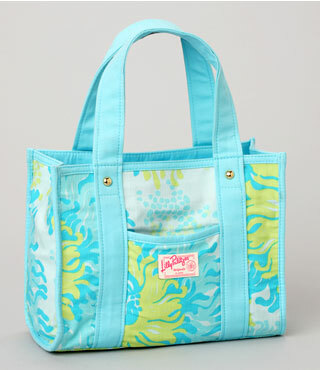 Lilly Pulitzer Seeing Things Tote that I got for my birthday. This adorable Lilly basket bag that I found at a second hand shop a few weeks ago... I love it! Does anyone know what the name of the print is? What are your new favorite things? Oh, the scottie dogs are so cute! I like scottie dog prints, even if I do have cats. That teapot kills me! It is so adorable! Great list! Love the Scotties!! those scottie dog pieces are so adorable. Beautiful photos, have a nice day Radka. I received a Lilly tote just like yours (different pattern, however) for my birthday! Adorable items featured! Happy Friday and Lovely Earrings! FUN Desk Accesories and Office Supplies! Weekend Relaxation and More Pretty Things!